JNation Entertainment is back with another installment of Korean music goodness. The showcase this time will feature an all-male trio band from Korea, Lunafly. 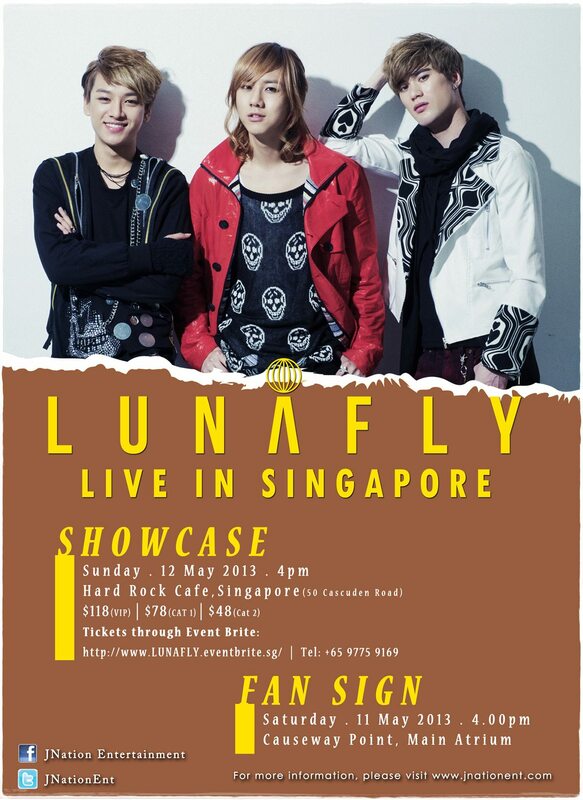 The showcase will no doubt be an opportunity to get up-close and personal with Lunafly. Prior to debuting, Lunafly made their musical mark by releasing self-composed songs ‘Superhero’ and ‘You Got That Something I Need’ onto iTunes. Comprising of 3 good-looking members, Teo, Yun and Sam Carter, the group debuted under Nega Network (home to Brown Eyed Girls and Sunny Hill) in September 2012. Leader Sam Carter, of Korean-British descent, gained popularity through his participation in MBC’s singing competition, Star Audition: The Great Birth 2. With the release of official debut single ‘How Nice Would It Be’, Lunafly received a lot of interest and positive response. Their songs have topped music charts on Cyworld and even on a Malaysian radio chart, amongst other notable artistes. They have formed an identity as an acoustic band, setting them apart from the typical dance-performing k-pop idol group. Not only vocally talented, the members are also skilled in song. Despite not having official promotions on music broadcasting stations, they have a steadily-growing fan base not only in Korea but around the world. Despite being a rookie group, Lunafly has already staged their first overseas solo concert in Japan last year, which ended on a successful note. Their first live performance in Seoul attracted over 2000 people. 2013 marks the continuation of Lunafly’s South Asia venture, as they tour and perform outside of Korea. There’s more in store for Lunafly fans, so stay tuned! VIP & Cat 1 priority sales start on 10 March 2013, 10pm. Only 300 tickets available for the showcase. You can also email to admin@jnationent.com, if you are unable to purchase it online. For more information, do follow JNation on Twitter and Facebook.